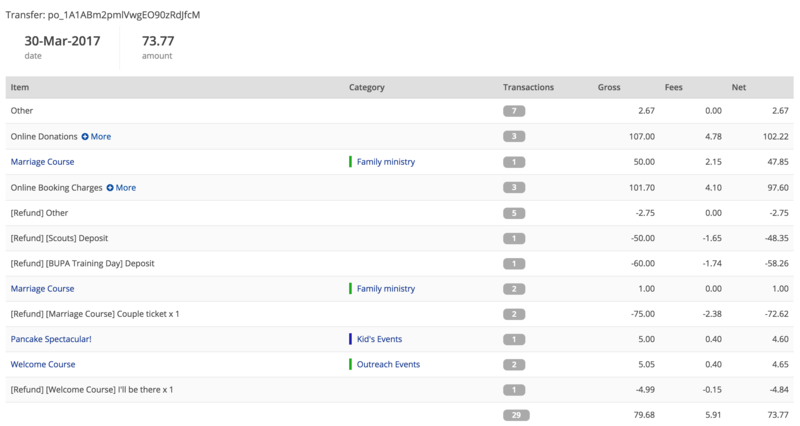 Reconciling Stripe transfer payments received into your church's bank account in respect of event ticket sales, online donations or booking charges is made easier using the Stripe Transfers report. The report can be found in the Calendar module, Giving module and Bookings module, with each report prioritising report results based on the module you are viewing. 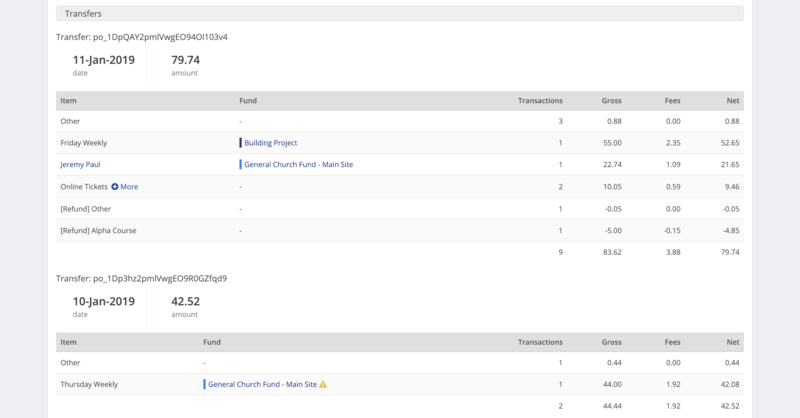 Each report's results respects each user's module permissions to ensure sensitive financial data is shown appropriately - for example, a user that doesn't have Giving module access is unable to click through into the detail of a Stripe Transfer to see individual giver and donation amounts. In this article we begin looking at the Stripe Transfers report from the Calendar module. The principles are the same for the Giving module and Bookings module. 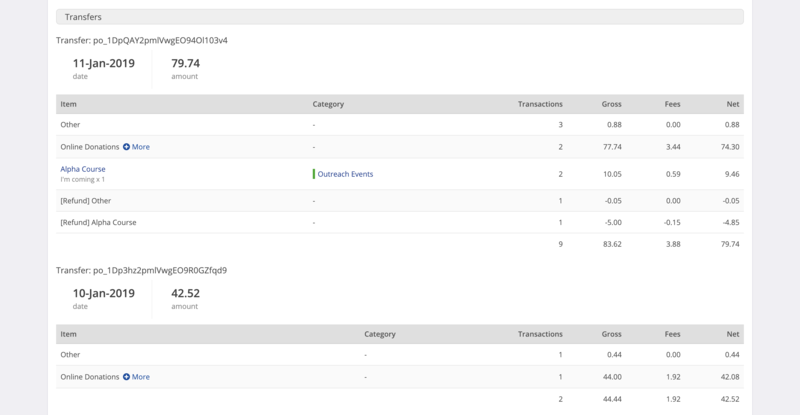 Click through to the module's Reports section and open the Stripe Transfers report. Filter the report for a range of Dates and click Generate to display the results. 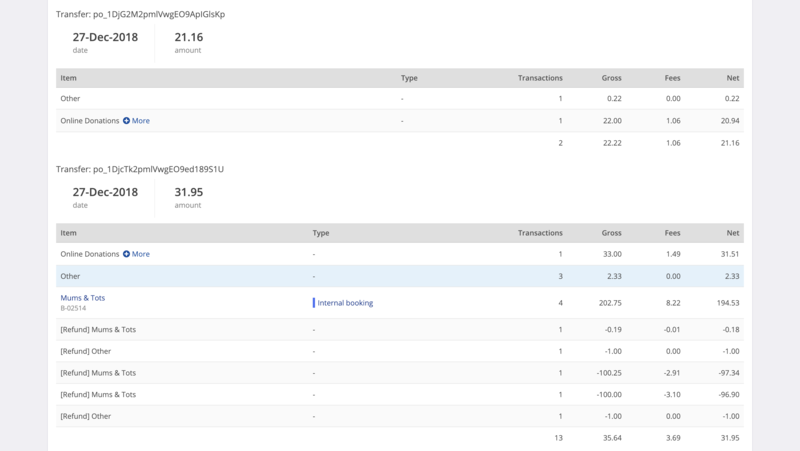 The report Dates are the dates that the transfers are processed by Stripe, not the date the transfers show on your bank statement. Banks don't return a statement "crediting date" to Stripe, so that information is not available for ChurchSuite to report by statement date. ...followed by the breakdowns of each of the Transfers that Stripe has paid out within the report's range of dates, showing the Gross, Fees and Net amounts. The +More option links you through to the Stripe Transfers report of the other respective module to see the breakdown of those amounts (subject to user permissions for the module). In the Calendar module the priority of report data is event ticket sales and ticket refunds, so you will see +More options next to Online Donations and Booking Charges. ...followed by the breakdowns of each of the Transfers that Stripe has paid out within the report's range of dates, showing the Gross, Fees and Net amounts. The +More option links you through to the Stripe Transfers report of the other respective module to see the breakdown of those amounts (subject to user permissions for the module). In the Giving module the priority of report data is donations and donation refunds, so you will see +More options next to Online Tickets and Booking Charges. ...followed by the breakdowns of each of the Transfers that Stripe has paid out within the report's range of dates, showing the Gross, Fees and Net amounts. The +More option links you through to the Stripe Transfers report of the other respective module to see the breakdown of those amounts (subject to user permissions for the module). In the Bookings module the priority of report data is booking charges and charge refunds, so you will see +More options next to Online Tickets and Online Donations. 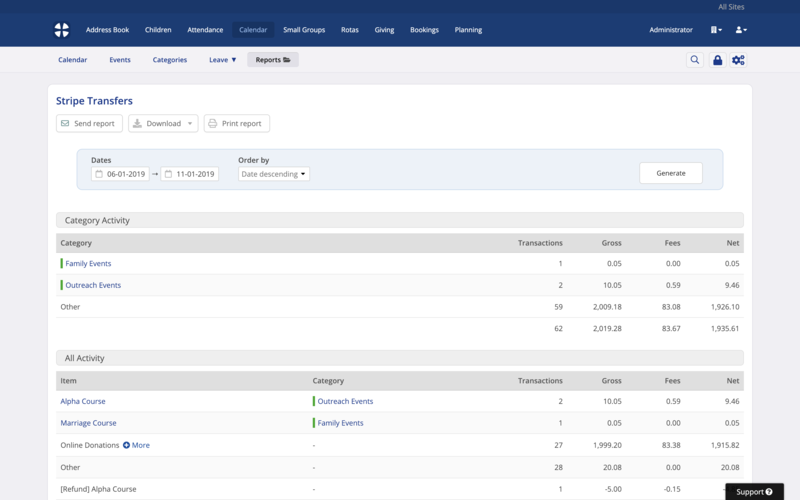 In each Stripe Transfers report, the Transfers section lists each transfer by the payout date from Stripe to your designated bank account within the report's range of dates. It can take 2-7 working days for the transfer to show on your church bank statement, with the first transfer taking between 5-10 working days for new accounts. The Stripe transfer reference number will correspond to the reference shown on your bank statement. 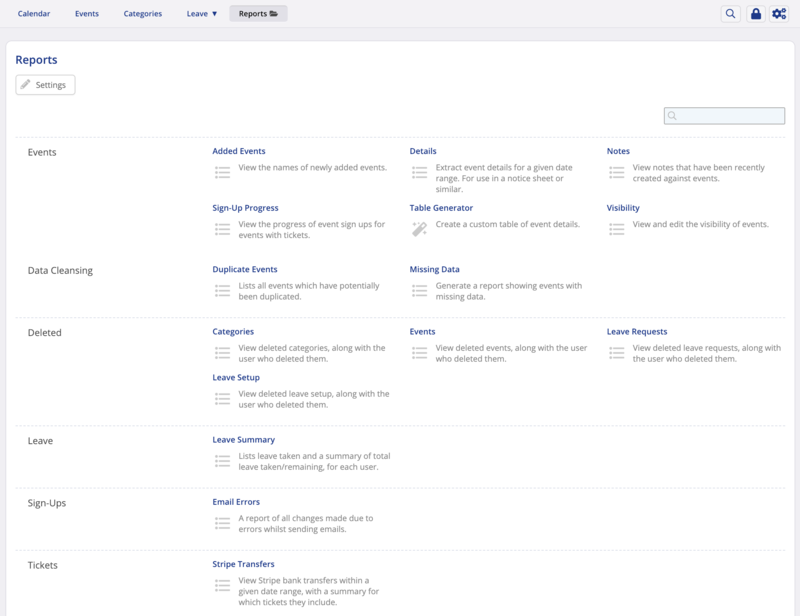 Note that within your Stripe control panel you can manage the frequency of Stripe transfers, choosing monthly, weekly, daily or even on demand - select the Settings menu within the Balance area of your Stripe account. Stripe transfers are subject to a minimum transfer volume of £1. This means that if you were to receive a donation or event ticket sale of £1, after fees this would be only 78p, under Stripe's minimum transfer volume. A transfer will be made once further donations or event ticket sales have been received taking the transfer volume over the £1 minimum transfer volume.